Simon Lynch, co-owner, Wicklow Wolf; Stephen Twaddell, chair, HBAN Food Syndicate; and Quincey Fennelly, co-owner, Wicklow Wolf. 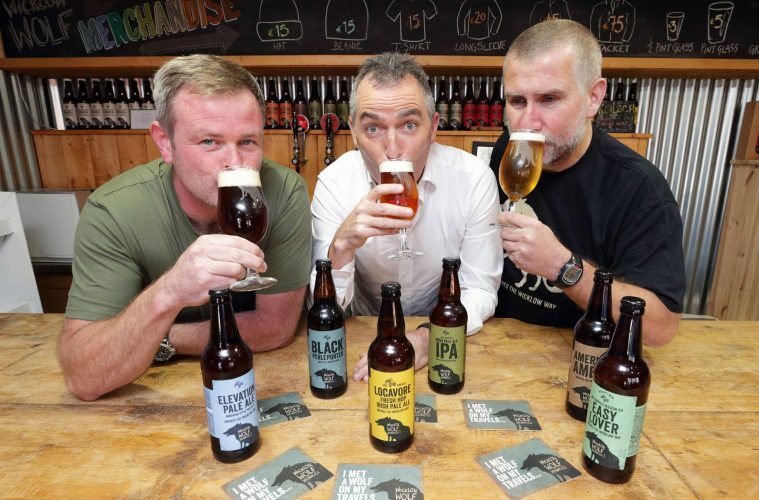 HBAN today announced a €2 million investment in craft beer company, Wicklow Wolf. HBAN’s Food Syndicate is one of the leading stakeholders in the deal, which is also supported by Enterprise Ireland and a number of private investors. Wicklow Wolf’s owners will use the investment to open a new, larger brewing site in Wicklow, which will enable a 15-fold boost in production capacity. This will support Wicklow Wolf’s plans to expand domestically and into international markets including the US, Asia and Europe. As it grows over the next five years, Wicklow Wolf will increase its staff base by 20. In doing so, Wicklow Wolf will increase its role in Ireland’s burgeoning craft beer industry, which is expected to see a turnover of €58M in 2016 – up 48% from last year. Helping the company achieve its business goals is the HBAN Food Syndicate, chaired by Stephen Twaddell, which contributed €722,000 to the deal. Each angel investor has a history of success in the food and beverages industry while Stephen, now chair of Wicklow Wolf, was previously president of Kellogg Europe. Founded by Quincey Fennelly and Simon Lynch through a mutual appreciation of good beer, the company started brewing in August 2014 and sold its first beer one month later to The Harbour Bar in Bray, Co. Wicklow. The business now supplies to 150 pubs and 550 off-licenses across the island of Ireland. Speaking about today’s announcement, Quincey Fennelly, CEO at Wicklow Wolf Brewing Company, said: “Wicklow Wolf started off small, selling to local pubs and off-licenses. We wanted to make sure we had a solid base at home before we even thought about selling abroad. As soon as we started brewing, the local support we received from the people in Wicklow was unbelievable and it continues to be just as strong. We feel that now we are well-positioned to bring Wicklow Wolf to the next level and the investment will be crucial to that. Richard Cullen, lead angel in the HBAN Food Syndicate and co-founder of The Jelly Bean Factory, said: “As soon as I met the guys from Wicklow Wolf, I was extremely impressed not only with their product, but their whole story and passion. From an investment point of view, they have it all. Welcoming the announcement Meabh Conaghan, Senior Development Advisor at Enterprise Ireland’s Food Division, said: “A key focus for Enterprise Ireland is to help companies start, innovate and scale internationally. Wicklow Wolf is a great example of an innovative Irish company with strong global ambition. Enterprise Ireland has worked closely with Wicklow Wolf over the last three years and we look forward to continuing to work with them as they grow their export sales, creating jobs in Ireland”. HBAN is currently on the look-out for more business angels to invest in high-potential start-ups like Wicklow Wolf. From Wednesday 9th November, the Business Angel Roadshow will travel to Waterford, Cork, Galway and Dublin, sharing information on what is required to become a successful business angel investor with prospective angels. For more information, visit hban.org.